SAN FRANCISCO--(BUSINESS WIRE)--Nov. 8, 2017-- Visa (NYSE: V), the exclusive payment technology partner at the Olympic and Paralympic Games, today introduced three commercially available wearable payment devices. 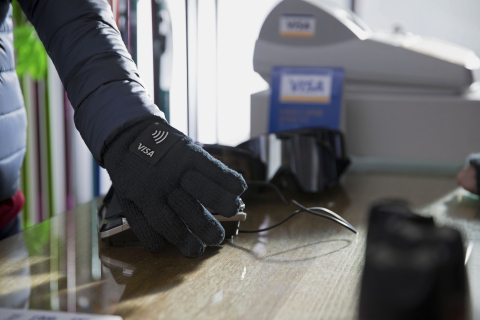 In the spirit of the Olympic Winter Games, Visa created NFC-enabled payment gloves, commemorative stickers and Olympic pins that allow fans and athletes to complete seamless and secure payments with a simple tap at any contactless-enabled terminal. Payment-Enabled Gloves: The average temperature in PyeongChang will be – 4.8°C1, so gloves will be a must-have! This payment glove will offer fans a way to pay safely and securely without having to get cold hands. The gloves contain a dual interface chip housed with a contactless antenna capable of completing purchases throughout official Olympic Venues and compatible readers globally. The gloves will come with embedded prepaid amounts valued at KRW30,000 or KRW50,000.